According to Brandon Hall Group, 61% of corporate learning and development (L&D) leaders think workers should connect with learning resources at least once-a-week to be effective in their jobs. Yet in a poll we conducted with Chief Learning Officer, barely one in four L&D leaders said their employees do that. To help L&D teams better engage employees, Degreed recently surveyed 512 people to understand how today’s workforce really builds their skills and fuels their careers. The findings, which are summarized in a new report titled, “How the Workforce Learns in 2016”, might make you rethink three common myths about workplace learning. 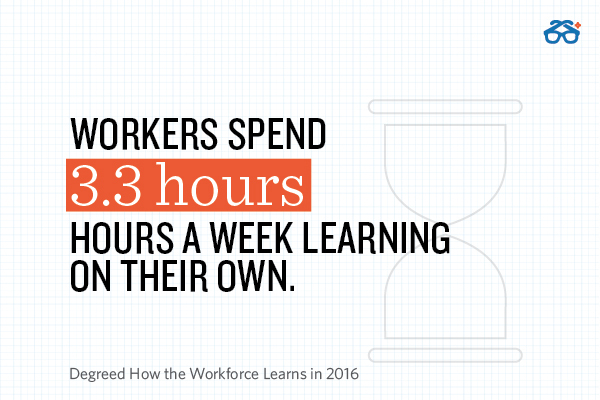 Myth #1: Workers don’t have time for learning. Truth: They will make time to learn, if it fuels their career growth or enriches their lives. Bersin by Deloitte has reported that 88% of L&D leaders believe employees don’t have (or make) the time to engage with corporate learning. But that’s not quite the whole story. While our survey respondents spend, on average, just 37 minutes per week on their employers’ training, they put in another 3.3 hours per week learning on their own. Nearly two-thirds of them say they would put in even more time if they received some kind of credit or recognition they could leverage for professional growth. Perhaps more tellingly, nearly three out of every four told us they have invested their own money in career-related development over the last 12 months – an average of $339 a year. That all tells us that most people will readily invest in learning – if it fuels their careers or enriches their lives. So don’t just train workers to comply. Help them grow and transform. Myth #2: Traditional training methods are obsolete. Truth: Traditional methods are not obsolete. They’re just incomplete. A lot of people are saying L&D is now “wildly out-of-sync” with how people learn and “the only real remedy is a revolution”. Microlearning, many believe, is the future. Well, not so fast. It is clear that bite-sized content dominates learning habits now. 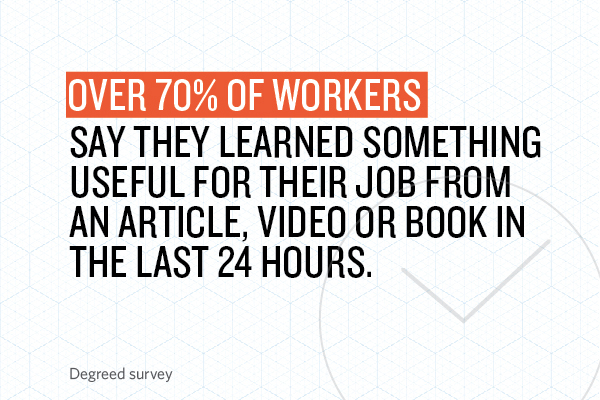 In any given week, 85% learn something for work through search, 69% by reading articles or blogs and 53% from videos. But formal training is still essential. Around 70% of people we surveyed take live, virtual or e-learning courses from their employers at least once a year. Many do so every few months. In either case, development is no longer confined to the workplace. Almost 80% now spend at least some time learning on mobile devices and 67% learn on personal time. The truth is, today’s workers learn sometimes and all the time, and from L&D as well as on their own. Make their curiosity count by blending microlearning with macrolearning. Truth: Responsibility for learning is shared between L&D, managers and employees. According to CEB, L&D leaders think 4 in 5 workers are “bad at learning” – that they don’t know when to ask for help or share what they know, how to seek out relevant knowledge, or how to extract value from information. We’re not so sure. Just 21% of people told us they rely on their L&D department when they need to learn something new for work, and only 28% said they search their employers’ learning systems. They look to their boss or mentor (69%), their colleagues (55%) or search online (47%) much more frequently when they need recommendations or answers. That doesn’t mean people don’t need help from L&D. In fact, those who said they have adequate guidance are more satisfied with their employer’s learning opportunities than those who don’t. What it does mean is that L&D teams have two roles now: Direct (creating, buying and delivering training) and indirect (giving self-serve L&D meaning by building an environment and culture that guides workers to the right people, experiences and resources). Many teams are already on their way to embracing these roles. In fact, 60% of respondents to our Chief Learning Officer webinar poll said they’re rethinking their L&D strategy in order to adapt to today’s learners. Almost half (48%) are looking to invest in new tools or technologies. Get the research that reveals the truth about workplace learning and how today’s workforce really learns and fuels their careers. Click here to access Degreed’s full report with all the data and insights you need to empower your learners and create a thriving learning culture. Welcome to the future.